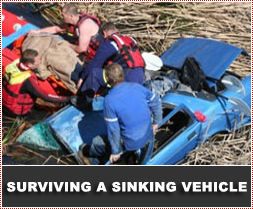 The need to escape from a sinking vehicle is a rarity. According to available data less than one-half of 1 percent of all auto crashes involve submersion. Yet, it does happen, and we need to ask the question whether we would be able to survive such an experience? With enough know-how, survival is definitely possible and we need to equip motorists with information that will enable them to survive. Motorists seldom have to confront a bridge collapsing underneath them and the risks are more often associated with cars driving off quay-sides or into rivers. Also included are problems that arise when the parking brake isn't applied properly with cars simply rolling down embankments into lakes or rivers. More common occurrences include being swept off the road in a flash flood as a result of a natural disaster. It is important to acknowledge that not all experts agree on all the survival tips and the precise sequence of escape - but there are some common threads that need to be identified and learnt from. On balance, it seems that the best course of action is to try and get out as soon as possible. What to expect from a sinking vehicle? The speed at which a car will sink depends on several factors, including the distance of the fall, speed and angle of entry and the physical characteristics of the vehicle. Most entries of vehicles into the water are smooth entries with the water cushioning the blow. Most people survive the initial impact with minimal or no injury at all. If you remain relatively calm there should be enough time for you to take action to save your life and the lives of your passengers. Newer cars that are better at keeping sound out will likely also be better at keeping water out. Most vehicles will float for a minute or two before beginning to sink. Cars usually sink at an angle, with the weight of the engine pulling down the front first. A rear-engine car sinks trunk-first. It is possible that the vehicle might flip onto its roof in deeper water. In a test in a controlled environment experts from the police tried to sink a car and were surprised to find that it took 5 minutes for the vehicle to sink. In a car that sinks front first, there will be a bubble of air in the back, but you should stay in the front ... the front windows are often bigger and easier to get out of — for all passengers. Experts agree that before you leap into action you should take a few deep breaths and calm yourself down. Making educated decisions could mean the difference between life and death. Once you have panicked you can't think clearly, you can't focus and you won't be able to save yourself. Staying calm and helping any passengers to stay calm is the single most important thing you can do to survive a car sinking in water. Many people fear that if they are wearing a seatbelt they will not be able to unbuckle it and will be trapped in the vehicle. If you were knocked unconscious you would be helpless. You wouldn’t have a chance to save yourself, let alone help anyone else. If you and any passengers are wearing seatbelts, chances of survival are much greater. The first instinct may be to unbuckle your seat belt and try to escape, but experts warn that passengers should first check their surroundings. You want to make sure the impact is over before you take off your seat belt. This might include the possibility of other cars or foreign objects heading toward the vehicle. If a belt won’t release, find something with which to cut it. Unbuckling your seat belt will allow greater freedom of movement. Be aware that the seatbelts might not retract; take care not to get tangled. If your head restraints are removable, pull them out when you release your seatbelt to enable easy passage for rear passengers. Once a vehicle sinks it may turn sideways or upside down. Occupants who are not buckled in with a seat belt will float within the vehicle and can easily become disoriented. It then becomes extremely difficult for them to find the windows or door handles. If you remain in your seated position (as you will if your seatbelt remains fastened) you will retain your orientation regardless of what position the vehicle is in. In some instances, the vehicle will sink quickly and you won’t have time to roll down the windows. Again, stay calm, unbuckle your seat belt and check on passengers. If you are sinking rapidly, you need to wait for the water pressure inside the vehicle to become equal to the pressure outside. Even though it might sound strange, it might be best to let the vehicle sink further and wait until things settle. Let the vehicle fill up with more water before attempting to open a window or door. This is because water rushing against a vehicle weighs thousands of pounds. Trying to open a door or window with that kind of pressure wastes valuable time and energy. And if you were successful, the onrush of water most likely would push you away, even pin you under the dash. It's only when internal pressure is equal to outside pressure that you can open the car door. When you are ready to open a door, the recommendation is to always choose a door on the side away from the water flow. It's much easier to open a door on the down river side of flowing water. Once you have escaped via the door or an open window the next best thing might be the roof of the vehicle and to consider from there the safest way of moving to safety. This might be t is easier said than done - automotive windows are made of tempered glass which is extremely strong. It takes a concentrated force against a very small area of the glass to shatter it. If you have a window shattering tool, use it to break either the side or rear window to escape. Spring-loaded punch has a steel tip that can shatter a window. Hardware stores call this an “automatic center punch” because it’s used to mark wood or metal before drilling a hole. Even though you might not have the best surviving tools for an “under water escape” there are everyday tools that might help you to shatter the window. An old spark plug, kept in your glove compartment, is heavy and strong enough to break a window. It may seem obvious - but don't try to save anything except lives. Computers, phones, purses, jewellery, etc. can be replaced - you can't! What about passengers in the vehicle? - Before you can save anyone else, you have to first save yourself! Once you reach the surface, take a few seconds to get your bearings, and if you have the swimming skills, take a deep breath and go back down. Hopefully, you can help someone else escape. Unless there is another person in the car that you are trying to save, you should never go back into a sinking or submerged vehicle. There is nothing, short of saving another person that is worth the risk. You and your passengers need to focus on one goal only and that is “to exit the car as quickly as possible”.